UPDATE: More than 40 people have been killed after a powerful 7.1 magnitude earthquake hit Mexico on Tuesday (local time). The quake hit only hours after many people participated in earthquake drills around the nation on the anniversary of the devastating quake that killed thousands in Mexico City in 1985. The governor of the central Mexican state of Morelos said at least 42 people were dead with that death toll expected to rise. Officials say that they're not sure how many people are trapped in various buildings that caught fire around the city. A powerful earthquake has jolted Mexico City - measuring magnitude 7.1 according to the US Geological Survey (USGS) - causing buildings to sway sickeningly on the anniversary of a 1985 quake that did major damage to the capital. 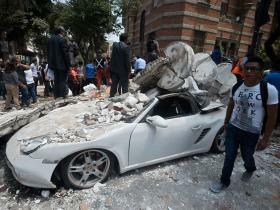 The quake caused rubble to fall onto cars, and some building facades to collapse to the streets. 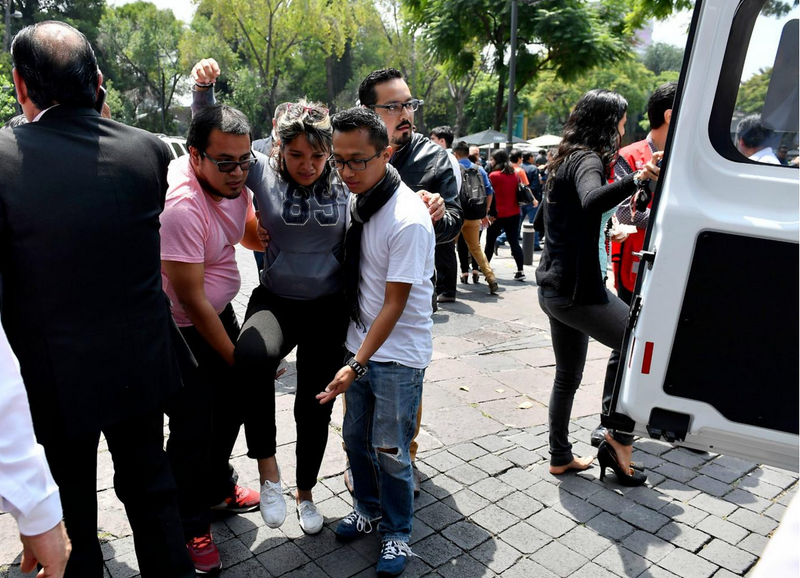 The extent of damage or injuries was not immediately clear, but people fled office buildings along the central Reforma Avenue. Local media reported at least five deaths, and an unspecified number of others who may be trapped in buildings throughout the city. Mexico's seismological agency estimated its preliminary magnitude at 6.8 and said its centre was east of the city in the state of Puebla. That municipality is about 40 miles southeast of the capital. One visitor to the city, who asked to be identified simply as Juan, was in a penthouse building in the city when the quake struck. He sent The Independent a text which said: "One word: apocalyptic. We heard the earth roar and the buildings creak. My heart was still pounding fast, minutes afterwards." Pictures fell from walls and objects were shaken off of flat surfaces. Some people dove for cover under desks. A video that appears to show the earthquake in action shows lights swaying above people crowding into hallways for safety, and then those lights seeming to lose power. Another video, streamed live on Twitter's Periscope in the Federal District of the city, showed dozens of men attempting to remove large metal beams that appeared to have fallen during the earthquake - it was not clear what was underneat. A car in the footage was covered in dust, another was smashed, and rubble was strewn all about.